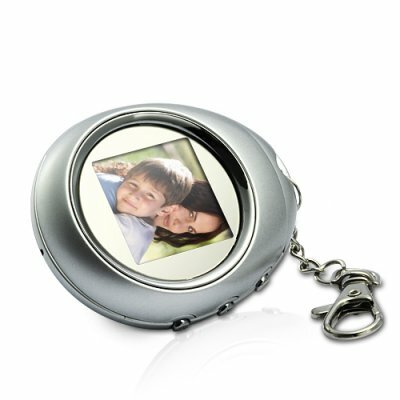 Successfully Added PictureMax P1 - Keychain Digital Photo Frame (Silver) to your Shopping Cart. Conveniently share your beautiful photos while on-the-go. This easy to carry digital photo frame is the perfect size to attach to any keychain, backpack or purse, and features a bright and colorful 1.5 inch screen that makes viewing pictures quick, easy and enjoyable. This mini digital photo frame comes with a forward/back button to quickly access your entire photo collection as well as a mini USB port for easily adding new photos anywhere there is a PC with a USB connection. Perfect if you need to keep several photos of your lover close to you or remember good memories when you feel sad and upset! This attractive little device makes a great inexpensive gift for your friends and family. With its durable construction, bright and colorful 1.5 inch screen, small and compact design, and rechargeable internal battery - good for hours and hours of continuous use, you simply cannot go wrong. Order your PictureMax P1 digital photo frame while supplies last and we’ll express ship your order within 24 hours and even include our full 12 month warranty on your entire order. Will this work with my Linux or Mac computer? For experienced computer users, it is possible. You can use the USB connection to transfer files from any USB 2.0 capable computer, but the internal software is only PC compatible, so you would need to use your own photo software to convert your pictures to the correct size.